Jazz&Jazz wishes to join others in expressing huge delight at the presentation of the 2012 Special All Party Parliamentary Jazz (APPJAG) Award to Acker Bilk on Wednesday, 16th May. 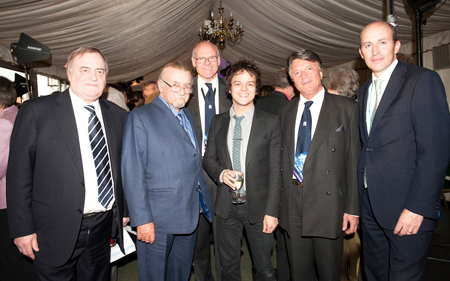 “Acker had a great night at the All Party Parliamentary Jazz Awards on Wednesday, 16th May. PPL really looked after him as he was escorted through all the security checks into The House of Commons. The Awards Ceremony was in the reception room leading on to the Pavilion Terrace. Acker had a good time talking to loads of jazz musicians such as Jamie Cullum, Bobby Wellins, Hump’s old drummer, Laurie Hollaway and so on. You would know them all better than I! He had a good laugh with Lord and Lady Prescott and Lord David Steel. “Acker was there to present the Jazz Musician of the Year Award and it went to Bobby Wellins. 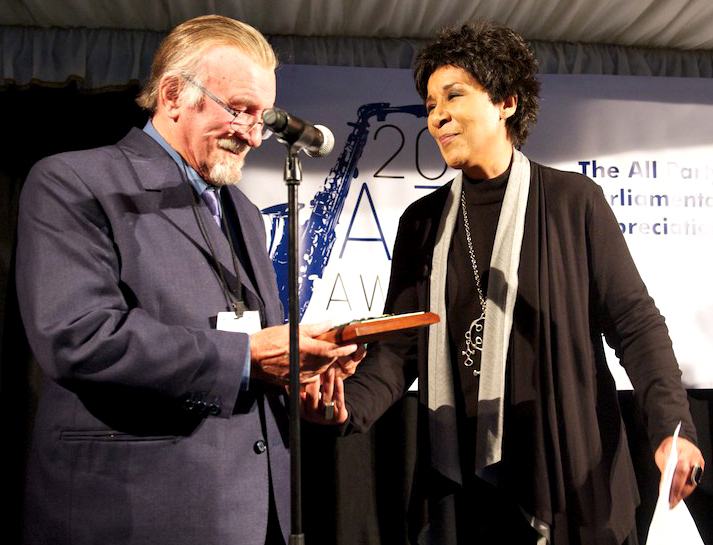 But the icing on the cake came when Paul Gambaccini asked him to stay on the stage for Moira Stewart to present him with the the 2012 SPECIAL APPJAG AWARD, their highest honour. Acker was genuinely delighted. A record number of MPs and peers, including Arts Minister Ed Vaizey MP, The Rt Hon The Lord Prescott and Lord David Steel, all members of The All Party Parliamentary Jazz Appreciation Group, attended the Jazz Awards, sponsored by PPL. Now the only UK jazz awards, the night was hosted by broadcaster Paul Gambaccini. Many renowned jazz musicians were present, including Acker, Jamie Cullum, Claire Martin, and Laurie Holloway.